Sixty powerful short essays about major social issues that are transforming America today. Each essay is followed by a special commentary section. The total work is a highly-objective reasoned - but startling - commentary on modern American problems. Please make sure to include your name and shipping address. Price includes shipping, handling and all applicable taxes. Silvio Laccetti writes with passion, but more important, he writes with authority about topics that matter. You want opinion writers to know their stuff. Silvio knows his stuff. Silvio's columns have always added a layer of humanity to the issues of the day, serving as a welcome change of pace to the political machinations typically being discussed in our op-ed pages. In discussing serious topics, he has a knack for examining broader societal concerns in a concise fashion that doesn't lose the interest of the reader, doing so with anecdotes and other personal observations that bring these issues closer to everyone's home. Silvio Laccetti may be a professor, but he doesn't write like one, and that's his strength. He uses simple sentences and descriptive words. He proves his points with concrete examples. He is a terrific storyteller; when I read his op-ed piece on how less could be more at Christmas, I couldn't put it down — I desperately needed to know where he was taking me. He has a real sense for what concerns readers, whether it's the empty handicapped parking spaces they pass on their way into the mall or the violent video games entertaining their kids. There is nothing esoteric about his work. And, like a good preacher, Laccetti comes up with ideas readers can carry home. Writing about video games, he proposes designing quests that encourage strategic thinking toward moral, just and peaceful ends through concepts such as mutual understanding, negotiation, compromise and peacemaking.... Say, how about developing an internet game called "Peace in the Middle East?" I don't know if anyone's done that, but I know it's a great idea, more relevant now than when the (Peoria, Ill.) Journal Star published it eight years ago. When I was reading the many potential op-ed pieces that passed through my hands each week, few made me ignore the ringing phone the way Silvio Laccetti's did. I figured our readers would do likewise. Rare is the academic who can explain complicated issues in a way the typical person one meets on the street can understand and appreciate. Silvio Laccetti is one. Strong, reasoned opinions, at times provocative, delivered persuasively and civilly, with wit and intellect. Agree with him or not, you will appreciate his powerful writing. Silvio Laccetti's essays display thoughtful analysis, wide-ranging intellectual curiosity and a sure-handed writing style. And buttressing each essay is an admirable decency of spirit. In sum, a superb thinker, skilled writer, astute observer. Silvio is a master craftsman of the commentary. His essays approach events and trends with wisdom, knowledge, enthusiasm, curiosity, creativity, and humor. Watching adolescents play video games might lead him to reflect on the nature of war and peace, while a busload of busted public officials could have him examining the relationship between corruption and civilization. Whenever I had the good fortune to get a submission from him, I knew I could expect it to take the topic and the readers in unexpected directions, drawing illuminating connections and yielding gratifying insights. Silvio Laccetti's work for The Providence Journal over the years was always rigorously reported and clearly - often charmingly - written. He would take a subject of national interest - a public-policy issue or simply a situation - and give it a regional spin without losing any of its broader, even universal, importance. He is an elegant essayist. 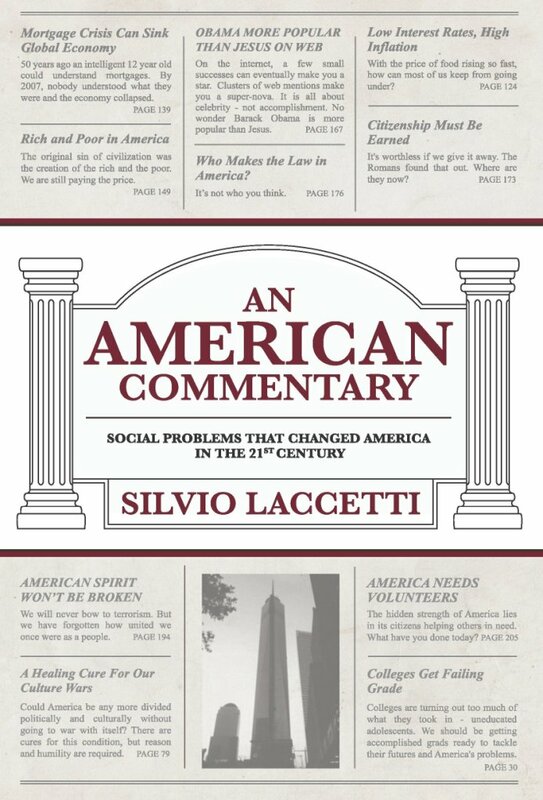 America needs more writers like Silvio Laccetti! As reliable as the Good Housekeeping seal of approval, the arrival by email of a story with Silvio Laccetti's byline is, for me, an assurance of an engaging read about life in New Jersey, life in America. Whether he is serving up a prescription for the betterment of community - a merger, for instance, of Grandparents Day with a program that teaches American history to young children with voyages through local neighborhoods; a proposal to create a senior council of knowledgeable, retired individuals to oversee town projects in order to rein in waste and combat mismanagement and corruption; or an exploration of the ethics of entitlement, wealth and the dignity of work - Laccetti provides sound research bolstered with insightful anecdotes, sometimes with a splash of humor, to bring depth and color to his essays. When an article by Laccetti appears on our op-ed page, we know it'll be a well-read page that day. You can count on Silvio Laccetti to find an intriguing perspective in almost any event, large or small, and analyzing it with wit, insight and historical command. His carefully crafted articles inform, entertain and surprise. Laccetti accompanies us on fascinating jaunts through America's social landscape. Entertained by his quirky sense of humor, encouraged by his humanity and enlightened by his deep understanding of our history, we start to notice connections where just a moment before we saw disparity. Most columnists are carried along by the tide of current events, offering their "take" from some tenuous vantage point, usually colored by class, politics and economic interests. Silvio Laccetti's work, by pleasant contrast, is grounded in a deep knowledge of history and solid grasp of human nature. Whether his topic is the Middle East in turmoil, the meaning of citizenship or the intricacies of the financial world, he looks beyond the obvious and short-term. In a genial, nonpartisan, yet passionate voice, he aims for a truer understanding of our world than the mass media can offer. Agree or disagree as you will, but make no mistake: Laccetti has done his homework. Throughout his career, and above all else, Prof. Laccetti has stressed the importance and necessity of critical thinking in his classes. Over the years, his students have often noted this particular life-long legacy he gave to them. That same spirit of inquiry informed by reason is the hallmark of his editorial writing and is suffused throughout his award-winning book. An American Commentary presents a unique perspective on fundamental problems changing America in a changing world. Author Silvio Laccetti sees us at the start of a new era in history, just as humanity was some 500 years ago at the time of the Renaissance. This compilation of 60 powerful short essays probes the dynamics of a wide range of social issues facing America today. After his critical analysis, Laccetti proposes pathways to solve problems. And, each essay is followed by a New Commentary section which updates each editorial and adds unexpected, refreshing personal material as well. Laccetti brings to this task all his knowledge, insights and wisdom gained from a lifetime of teaching and learning, scholarship and public policy making. His talent is enhanced by an appreciation of the Classics and the values that they have inspired and represented throughout the ages. The result is a highly objective, reasoned - but startling - commentary on inflammatory issues confronting our society. After reading this book, the reader will look at the world in a different way! An American Commentary is a must-read for any concerned American interested in the nature of our social dilemmas. With tons of material tightly packed in each essay, serious students of American History, Social Science, American Studies and General Humanities will treasure this volume. You will not forget An American Commentary. It will be a permanent addition to your library and your thinking about America and the future of the world. 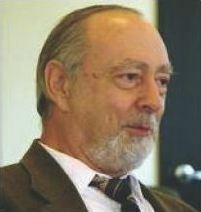 Silvio Laccetti began his distinguished college teaching career in History and Social Sciences at Stevens Tech. when he was just a few years older than his senior students! Over the decades, he has been the recipient of numerous awards for teaching excellence, including recognition by the Danforth Foundation and the Woodrow Wilson National Fellowship Foundation. He has also received three Outstanding Teacher Awards from Stevens. He has published four books and countless articles, essays and editorials. Dr. Laccetti is a Pulitzer prize nominee. In his professional work, Professor Laccetti has sought to enlarge the classroom experience by creating teaching and learning opportunities with hands-on internships in public service. These efforts have had local, state and national impacts and a profound influence on his students. The author has also been a consultant to business and industry, a civic organizer and a public policy advocate both in New Jersey and nationally. His editorial journalism is tremendously enriched by these many endeavors and by the expertise he has accumulated over a lifetime of achievement. Are Bosses Kings and Queens? Who Makes the Law in America? Copyright © COMMONWEALTH BOOKS LLC. All rights reserved.